This Knitting Baby Sweater page is a continuation of the Baby sweater page where we designed a pattern for a baby sweater. Now lets use it for our knitting project. First of all, we will simplify its look to make a working sketch which is easy to use. I cleaned all extra information and now our pattern is ready for work. Here it is. 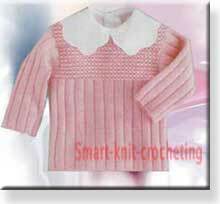 A classical pattern for knitting baby sweater. Sure it is not the only possible pattern to knit a baby sweater. But our goal for today is to understand the idea about knitting a sweater. Once you know the principle, it will be easy to figure out how to work with any kind of pattern. No matter whether you are going to knit or to crochet a sweater. We are going to knit this pink sweater. I don't say that this is "the cutest sweater in the world" to convince you to knit it. It is just a regular classically shaped sweater. But you know this saying:" Give a man a fish and he will eat it for a day. Teach a man to fish and he will eat for the rest of his life." My point is, that you shouldn't buy a pattern or take it from the book together with description and after that have a big headache if your yarn and knitting needles didn't produce the recommended stitch gauge or your child needs a little bit different size of a sweater. Be your own boss. :) Lets go to learn fishing! Step 1. Analyze chosen design. 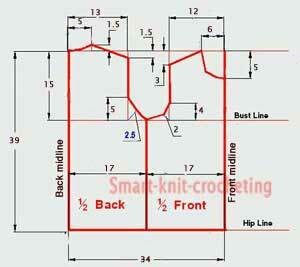 Pattern #1 - ribbing (Knit 5, Purl l) is used for all sweater parts besides its top. Pattern #2 - garter stitch pattern is used for the top part of the sweater body. Pattern #3 - ribbing (Knit 1, Purl l) is a band around the neck line. There are a few ways for knitting a baby sweater. In our example we will knit two parts (front and back)of a sweater separately beginning from the hip line. Direction of knitting sleeves upwards starting from the cuff. Step 2. Make a gauge swatch for each stitch pattern. For knitting baby sweater take the yarn you like, try a few knitting needles, (use the one recommended one on the yarn label as a starting point), choose the gauge swatches you like the best and calculate gauge for every one of the three patterns necessary. Here are the gauges for knitting baby sweater of our example. Pattern #1. (Ribbing 1x5). Gauge: 20sts=10cm, 28 rows=10 cm. Pattern #2. (sweater top ). Gauge: 22sts=10cm, 28 rows=10 cm. Pattern #3. (Ribbing 1x1). Gauge: 18sts=10cm, 26 rows=10 cm. Step 3. Calculate number of stitches and rows for knitting baby sweater. 2 sts/cm x 34 cm = 64 sts. Pattern#1 has 6 sts to repeat (Knit 5, Purl l) through the pattern. 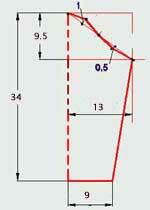 Hence, number of the stitches has to be multiple to 6: 60 sts (pattern itself) + 2 sts to form the edge= 62 sts. Repeat to knit the rows until piece measures 24 cm: 2.8 rows/cm x 24 cm = 67 rows. To make change from Pattern #1 to Pattern #2 at the Bust Line (68th row): 2.2 sts/cm x 34cm = 74 sts (rounded). It means that difference between number of stitches for two patterns is: 74 sts - 62 sts = 12 sts. They have to be added evenly through the 62 sts. 1. Share number of the stitches to decrease into 3 parts. If it can't be shared into 3 equal parts, add "extra" sts to the 1st part. Part 2: 1 stitch at the beginning and at the end of every "right" row. (total number of rows is equal to the number of stitches of the second part). Part 3: 1 stitch at the beginning and at the end of every other"right" raw. (There are 3 rows between those 2 "right" rows where decreases have to be done). For our example it will take us 13 rows to form armhole. Continue 25 rows more to reach a shoulder line. There are 38 rows between bust and shoulder line total. According to our pattern a neck line begins in the middle point of the shoulder line height. But it is planned to make a band around the neck line. If its width is about 2 cm, the lowest point of the neck line will practically be located as the level of the lowest shoulder point. It means, that we have to make some changes to our pattern. Original slope of the shoulder line was 3cm / 8cm (see the pattern). Now it will become 2cm / 6 cm. Hence , to form a shoulder line we have to bind off: 2 sts/cm x 6 cm = 12 sts through the height of 2.8 sts/raw x 2 cm = 6 rows for each shoulder. A new neck line is 58 sts - 2 x 12 sts = 34 sts wide and 6 rows tall. Mark midpoint of the back (28sts) and work each part separately. Bind off a shoulder line: 4sts at the beginning of every "right" raw. (6 rows total). To form a neck line: at the end of every "right" raw place on a stitch holder: 1st raw - 7 sts, 2nd - 4sts, 3rd-4sts (the same 6 rows as the shoulder line). Front Part. Knitting Baby Sweater. Make calculations for the knitting baby sweater front part similar to calculations we've made for the back part. Back and front parts have differently shaped armholes and neck lines, but the principle to calculate them is still the same. Cast on: 2sts/cm x 18 cm = 36 sts. Work until piece measures 24.5 cm x 2.8 rows/cm = 67 rows. At this point you have to have on your needles: 2sts/cm x 26 cm = 52 sts. Hence, 8 stitches from each side have to be added (16 sts total). Make calculation for increase using gauge. bind off 52 sts in : 2.8 rows/cm x 9.5 cm = 27 rows. Here is a method which works good for any number of the needles and kind of yarn. 1. Share the number of the stitches for 1/2 of the sleeve width (26 sts for our example) into 3 parts. If it can't be shared into 3 equal parts, add "extra" sts to the 1st part. Part 1Divide number of stitches to decrease into combinations of 3sts and 2sts. For our example it looks like: 3sts, 3sts,2sts (8 stitches total for one side). Cast off them at the beginning of every raw. If it can't be shared into suggested combination of 3sts and 2sts, add "extra" sts to the first group of 3sts if necessary. Part 2: Divide number of stitches by 3. For the 1st and 3rd thirds: 1 st at the beginning and the end of every "right" raw. For the 2nd third:1st at the beginning of every other "right" raw. Part 3: 3sts at the beginning of every raw.